Subway is a well established brand with something unique to offer — fresh sandwiches made to order. But Subway’s competition is fiercer than their fresh jalapeños. There are bigger brands out there with more money to spend. Plus they’ve got the supermarkets and their ever more popular meal deals to fend off. 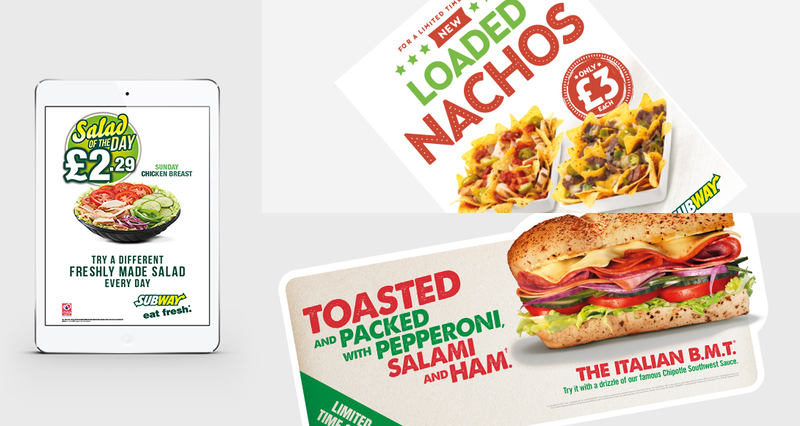 We create campaigns for Subway which get noticed and get people in store to discover and try great sandwiches and more. We communicate quality, value and new products whilst still celebrating the ‘Eat Fresh’ ethos people love the brand for. Helping the Subway team to build their business as well as they build their fresh Subs.